More fun with PVC! | The Life and Times of a "Renaissance Ronin"
… we talked about something other than ISBUs or plasma cutters… we talked about using PVC to build a Greenhouse/Chicken Coop to get a jump on chores. After all, the more chores we get out of the way, the more time we get playing with the plasma cutter! And before you ask… Yeah… I’ve actually done this. In fact, it started a “range war” with my neighbors, who thought it “looked like a blight” and gave me all kinds of grief. In reality, I think that several “soccer moms” just got on their hubbies to do likewise, and those guys didn’t like the idea too much. But, no one ever said anything to me “directly” as I was always out in the driveway working on a Harley, and I usually had some “tat covered – big burly biker type” handing me tools. I think the neighbors thought that if they confronted us, we’d thrash them. Take 4″ pipe and using a circle saw mounted in your drill, cut 2 1/2″ holes in it, spaced evenly along the lengths of your pipe. And don’t be an idiot! Line up all the holes first! The last thing you want is holes running “willy-nilly” all over the place. Neatness counts, huh? I bore holes about every foot or so, on center. But depending on what you’re planting, you can go closer. Don’t go any closer than 6″ though. The holes will be too close together for good root production to take place inside the pipe. These holes are where you’re gonna stick your plants, so do yourself a favor and hit them with a little sandpaper first, or you’ll scratch yourself to pieces. I know that you’ll probably survive a scratch or two, but heaven forbid your kid gets a gash on his knuckles while helping you plant the crops. Your wife will look at you like you’re Charley Manson! Now, you can just run these pipes down the outside of your fence posts, but I double them up. I mean, I’m already there, and I do love using power tools, so what the heck, eh? Plus, you get a REALLY sturdy fence that way. If you’re going to run 2 sections per “row” – alternate your hole locations, so that everybody gets enough room to grow without crowding. You can wrap fabric over the ends of the pipe, to allow for drainage. 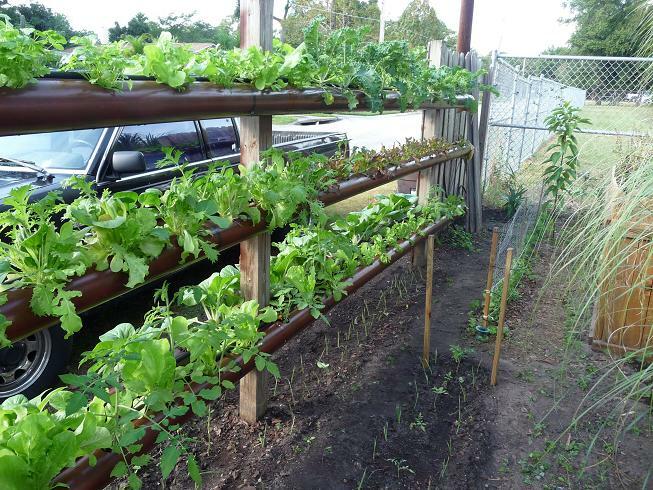 Now, just sink some 4×4 fence posts in the ground, and then run a piece of your garden pipe between them, both sides, front and back. I secure them to the posts using hurricane straps and drywall screws. It’s easy. Starting high enough off the ground to insure that your dogs don’t pee in them, just run them up a few feet apart, until you get to shoulder height. Anything higher than that is hard to plant, tend, and harvest. 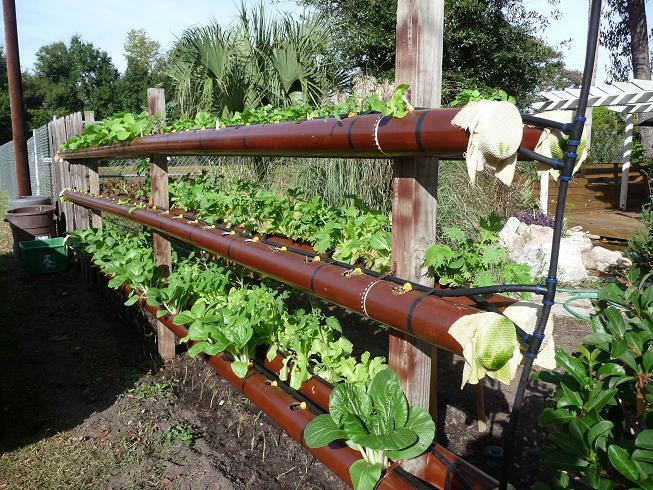 A drip irrigation system snaking up and down, back and forth… keeps everything green and maintenance free! Note that the ends are depressed, so that they angle down slightly, to help with drainage. Just put a little pressure on them with the hurricane straps to get them angled down the way you want them. 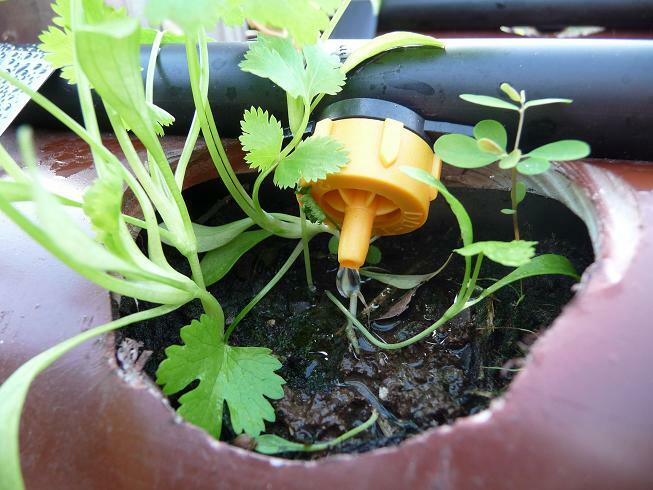 I put a big container plant at each end, to catch the “extra” water drainage. Don’t want to be accused of wasting water! When you’re thru, you have a sturdy fence, fresh food, and dense, lush, glorious… privacy. These photos are of Peter Duke’s fence garden, in Orlando, FL. I’d have used my own photos, but a hurricane ate them. After I get a new fence built, I’ll add my photos to the mix. I write this blog, because like many other families in America and beyond right now… my family’s SURVIVAL is at stake. This blog is the one thing that we can do to help others. I’m asking you to get involved. We’re drowning here. IF you can, consider “throwing us a bone”, huh? If I’ve helped you, informed you, educated you, or just entertained you with the hundreds of informative posts we’ve written… please consider donating a few bucks to the blog, to help MY family survive and rebuild OUR own home. Every dollar counts, and every single penny gets very carefully spent. There’s a Paypal button located right up there at the top of the page. It’s easy, it’s SAFE, and it’s SECURE. And we’ll appreciate it more than you can possibly know. I kinda wanna do this. It keeps the wabbits out of your lettuce! But I has a gardenspot… with a wabbit fence. I will file this into my – THINGS THAT ARE COOL brainspace. Just be sure that you put the lid firmly on the PVC glue when filing stuff like this away in yer “brainspace,” or the fumes will make you grin like an idiot, eat your brain, and… you’ll drool all over yourself. Hey wait is this it? I think I can grab it if I just stretch.. WHOOPS (thud) I just slipped in the…ewwwwwww.